It’s the most wonderful time of the year — for blogging. Give your blog a temporary holiday theme and meet your readers’ expectations for a bright and joyful time of year. Small changes make a significant impact on your site visitors, and WordPress makes it easy to add some seasonal cheer. Experts predict holiday eCommerce sales will rise by 16.6 percent this year as more and more people embrace the ease of shopping online. Set the stage by adding some holiday flair to your blog using these five strategies. One way to give your site instant cheer is to switch to a holiday theme until the first of the year. 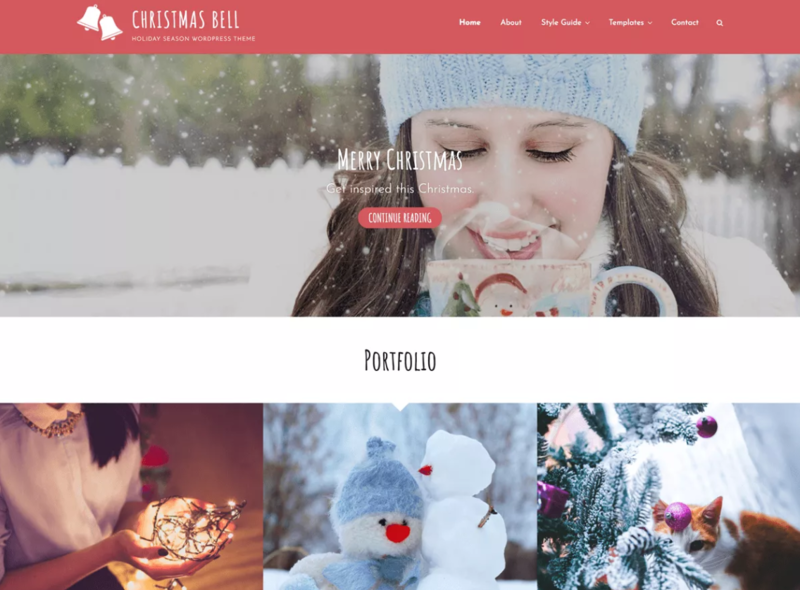 There are some free themes on WordPress.org, such as Christmas Bell. Do a quick search, and you’ll be surprised at home many free themes pop up. Be sure to look for one similar to what you already have, so the tweaks are minimal. To download the theme, go to your WordPress dashboard and choose Appearance/Themes/Add New. Click on Upload and install the new theme. Select your new design as the active theme, then double check that everything works correctly. A beautiful holiday theme needs to work seamlessly. You’ve invested a lot of time into updating for the holidays, so make sure it’s a positive experience for your customers that keeps them on the site and doesn’t drive them away. Little embellishments add to the feel of the holidays without a lot of additional effort on your part. For example, you can use the plugin Christmas Ball on Branch to add an animated Christmas detail to the corner of your blog’s header. The basic version is free. If you want more control over where you place the branch, a pro version is available that adds features. Christmas Panda does something similar, but you can add trees, Santa, snowfall, or a pop-up about Christmas. These are just two of the possible plugins available that allow you to add embellishments very easily. Do a search on WordPress.org or through the Plugins tab in your Dashboard using the word “Christmas,” and you’ll find many other options. Installing a plugin is similar to installing a theme. Go to your Dashboard and click on “Plugins.” Click on Add New/Upload and install from the location where you’ve saved the plugin. You will then need to activate the plugin from the Plugins tab. Every plugin has different settings, so look under your tools or within the Plugins tab to find the settings for the plugin you’ve chosen. Everywhere you go throughout the holidays, music is playing. If you hit the shopping mall, Jingle Bells is playing over the loudspeakers. If you dine out, a soft rendition of Silent Night plays in the background. Radio stations go to all Christmas music all the time. Adding a little mood music to your site puts visitors in the shopping mood. One easy way to add music is with another plugin called Christmas Music. This plugin chooses the song for you, but also allows your visitors to turn off the sound with a single click. A disable button is an important feature to add if someone is browsing your site while at work or doesn’t want music playing because their Internet connection is a bit slow. If you want to add more general music, you can use a plugin such as Soundy. What would the holidays be without a little snow? You can make it snow on your site with a variety of plugins. Some of the plugins that make it snow include WP Super Snow and Snow. A couple of things to keep in mind include offering an option for visitors to turn off the falling snow. While the snow will fall seamlessly for most users, if there is an issue, the user can turn off the feature. Have you ever noticed that Google swaps out their logo to tie into different holidays and special occasions? The basic font stays the same, but they might add a Santa hat on one corner or a little background behind the letters. You can do something similar for the holidays by adding a faded out snowflake behind your logo or a small graphic to one of the letters. Changing your logo is relatively simple in WordPress, so it shouldn’t take much time to adjust it. Keep in mind that the idea is to add a temporary festive spirit to your site. You don’t need to spend endless hours creating a unique graphic. Other programmers have laid the groundwork for you with the plugins mentioned above, as well as the many options for free themes and embellishments that give your site holiday spirit without the extra work. Kayla Matthews is a WordPress blogger and independent writer. She’s done freelance work for Digital Trends, The Week, Website Magazine and VICE. To read more posts from Kayla, visit her blog, Productivity Theory.